Evan is Tony’s boyfriend in Grand Theft Auto: The Ballad of Gay Tony. He is a former bodybuilder and responsible for getting Tony addicted to drugs again. 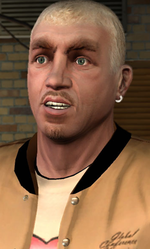 He ends up dying at the end of the game during the mission “Frosting on the Cake.” In GTA: The Lost and Damned the player experiences this from the point of view of Johnny Klebitz in the mission “Diamonds in the Rough,” who kills Evan. A video of all of his appearances or times he is mentioned in the game is available here.